Cantabria, MOGRO. House with two luxury apartments, pool and paddle tennis court. 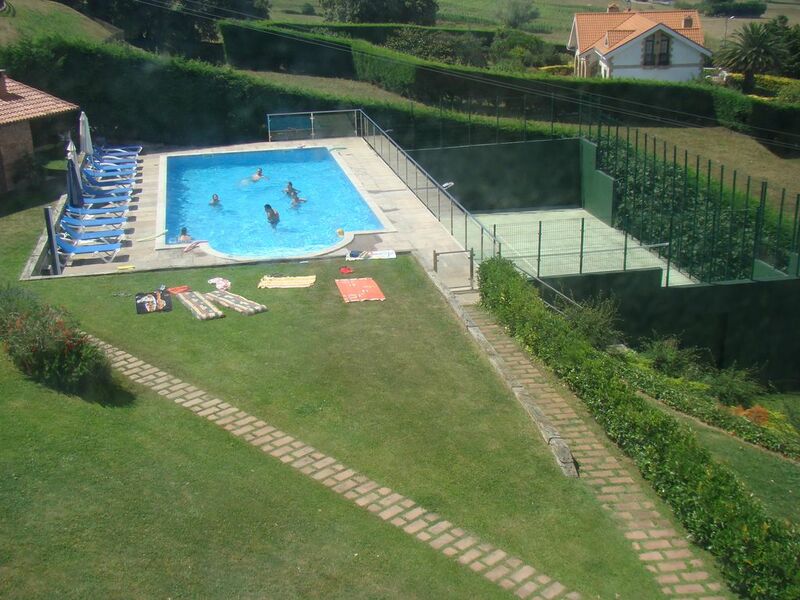 Closed garden of 3000m2, with barbecue and park for children. In front of the beach of Usil-Mogro and Natural Park of the Dunes of Liencres (the most important sandy area of ​​the North coast). 800m from the "Abra del Pas" Golf Course. Beaches of fine sand in all the surrounding towns, being the most important the estuary that configures the Pas River. Surrounded by a great landscape environment combining the greenery of the countryside and the sea. Very quiet area to go with children. It has free WIFI. The apartment has two bedrooms, living room, kitchen, toilet, bathroom, terrace and garage. Fully equipped: appliances, crockery, house linen, free wi-fi. Located in the center of town with all the services nearby: supermarkets, cafeteria and restaurants. Excellent communications both by road (Autopista del Norte A67) and rail. It is in a strategic place to move and visit all of Cantabria and neighboring provinces. 10 minutes from Santander, 8 minutes from Santillana del Mar, 15 minutes from the Cabarceno Park, 25 minutes from the Soplao Caves, 20 minutes from San Vicente de la Barquera, 30 minutes from Comillas, 60 minutes from the Picos de Europa, 60 minutes from the Guggenheim Museum (Bilbao). Animals are not permitted. If necessary, the tenant is picked up at the airport and at the station. Area with excellent restaurants to enjoy good food, bars and drinking areas. Ideal place to enjoy a family holiday and good geographical location to travel and get to know Cantabria with its beaches and mountains. The months of June, July, August and September, we rent a minimum of one week, from Saturday to Saturday. It has free wifi. Apartamento nuevo, limpio y acogedor. Las vistas son muy bonitas y está cerca de Santander. Es la segunda vez que estamos en el apartamento y pensamos volver. El apto es cómodo, está limpio,bien equipado y perfectamente atendido por José Manuel y Angela que son muy cercanos y siempre dispuestos a ayudar. La piscina es un plus para familias con niños o si te gusta nadar o bañarte sin riesgos. A sido un placer teneros en nuestros apartamentos. Seréis siempre bien venidos. Apartamento muy tranquilo, acogedor, limpio y bien equipado. Con vistas fabulosas de prados y ria (muy bonitas las subidas/bajadas de la marea en la ria. Muy cerca de Santander (10-15 minutos en coche). Los paseos por el entorno son muy agradables. Los equipamientos ( jardín, piscina, aparcamiento, etc...), tal y como lo describen los propietarios en el anuncio. Los propietarios muy atentos en todo momento. Recomiendo el sitio, nosotros seguro que volveremos. The town of Mogro is ten minutes from Santander. Ideal place to spend a family holiday, to go to the beach, visit very beautiful areas and villages in the surroundings. Some very good restaurants to taste good meals.